In the Bombay Presidency, the use of printed textiles was concentrated in the Gujarat districts, where women tended to wear clothing with patterns that covered the whole cloth….Even as late as 1938, more than 1500 artisans, using stamps that they altered from year to year as styles evolved, participated in the calico-printing industry of Ahmedabad. Small Town Capitalism in Western India: Artisans, Merchants and the making of the Informal Economy, 1870-1960, Douglas E. Haynes. The Making of the Mahatma is a 1996 bilingual film that covers Gandhi’s years in South Africa. 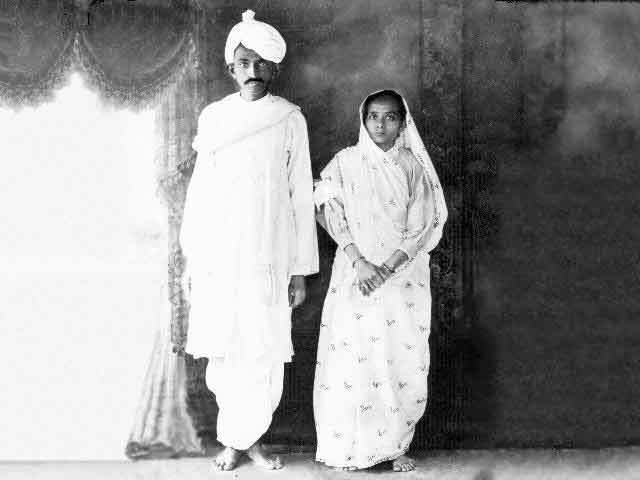 It also touches on his family life, Gandhi was – to put it mildly – not the best of husbands. Prior to the South Africa move, the family was outfitted in what was modern Indian for the time. This meant a Parsi style bordered sari for Kasturba. But a number of pictures also show Kasturba in printed saris. Block printing was common in Gujarat (and Rajasthan) as were lighter colours as opposed to the handlooms of neighbouring Maharashtra. In the movie, no doubt based on existing photographs, both kind of saris are seen. As well as the voluminous blouses popular at the time (Gandhi and Kasturba returned to India in 1915). Note also the gloves at the time of arrival in South Africa (1893). Gandhi himself changes from completely Western attire as a barrister newly returned from Britain to the adoption of a few elements (headgear was the usual mode of doing this, in the last pic of 3 men the headgear is Muslim, Parsi and Gandhi’s Kathiawar turban) to his final adoption of completely Indian attire on his return to India. This entry was posted in Colonial, Costume, Early 20th Century, Family, Independence, Indian Dress, Indian History, Late 19th century, South Africa, Vintage Dress and tagged 1890s, 1910s, Indian independence, Kasturba Gandhi, Mahatma Gandhi, Making of the Mahatma, sari, sari bouse, Shyam Benegal. Bookmark the permalink. Loved the men’s different headgear! Yes they are quite distinctive, I should do a post one day!